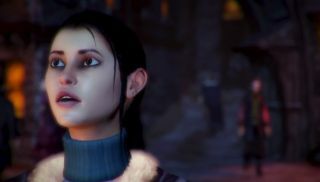 In the final week of their Kickstarter campaign , Red Thread have released the first proper trailer for Dreamfall Chapters . It (re-)introduces everyone to the twin worlds of Stark and Arcadia, and also attempts to break the record for number of times a narrator says "dream", or some variation thereof, in a three minute period. It stops just short of chanting "dreamy dreaming dreamer dreams dreams." The follow-up to The Longest Journey and Dreamfall has been a huge crowdfunding success. The current total, over $1,174,000, has easily broken not only the initial $850,000 target, but also the first round of stretch goals. Additional milestones have since been added, with both an interactive graphic novel and improved soundtrack already secured. Targets still to be achieved include German and French language support at $1.25 million, an unrevealed bonus at $1.5 million and the mysterious "The Longest Journey Home" at $2 million. With five days to go, that last target might seem a bit of a stretch, but there's every chance of a last-minute funding push - especially if Red Thread announce what it is backers are pushing toward. UPDATE! As the exquisitely named Sesquipedaliann points out in the comments, details on The Longest Journey Home stretch goal have already been revealed. Red Thread describe it as the "continuation and conclusion to April Ryan's journey" - a second game that would be released after Chapters. Details are available here and here .